In a previous post I discussed randomized feature maps, which can combine the power of kernels and the speed of primal linear methods. There is another randomized technique I've been using lately for great justice, randomized SVD. This is a great primitive with many applications, e.g., you can mash up with randomized feature maps to get a fast kernel PCA, use as a fast initializer to bilinear latent factor models aka matrix factorization, or leverage to compute a giant CCA. The basic idea is to probe a matrix with random vectors to discover the low-dimensional top range of the matrix, and then perform cheaper computations in this space. For square matrices, this is intuitive: the eigenvectors form a basis in which the action of the matrix is merely scaling, and the top eigenvectors have larger scale factors associated with them, so a random vector scaled by the matrix will get proportionally much bigger in the top eigendirections. This intuition suggests that if the eigenspectrum is nearly flat, it will be really difficult to capture the top eigenspace with random probes. Generally this is true, and these randomized approaches do well when there is a “large spectral gap”, i.e., when there is a large difference between successive eigenvalues. However even this is a bit pessimistic, because in machine learning sometimes you don't care if you get the subspace “wrong”, e.g., if you are trying to minimize squared reconstruction error then a nearly equal eigenvalue has low regret. Here's an example of a randomized PCA on mnist: you'll need to download mnist in matlab format to run this. % NB: algorithm more accurate. 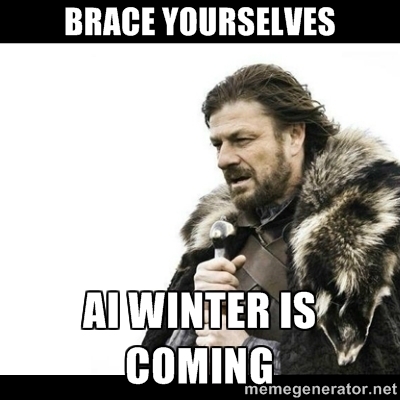 loading mnist finished: Elapsed time is 6.931381 seconds. estimating top 50 eigenspace of (1/n) X'X using randomized technique finished: Elapsed time is 0.505763 seconds. estimating top 50 eigenspace of (1/n) X'X using eigs finished: Elapsed time is 1.051971 seconds. That difference in run times is not very dramatic, but on larger matrices the difference can be a few minutes versus “longer than you can wait”. Ok, but how good is it? Even assuming eigs is ground truth, there are several ways to answer that question, but suppose we want to get the same eigenspace from the randomized technique as from eigs (again, this is often too stringent a requirement in machine learning). In that case we can measure the largest principle angle between the top-$k$ subspaces discovered by eigs and by the randomized PCA, as a function of $k$. Values near zero indicate that the two subspaces are very nearly identical, whereas values near $\pi / 2$ indicate one subspace contains vectors which are orthogonal to vectors in the other subspace. 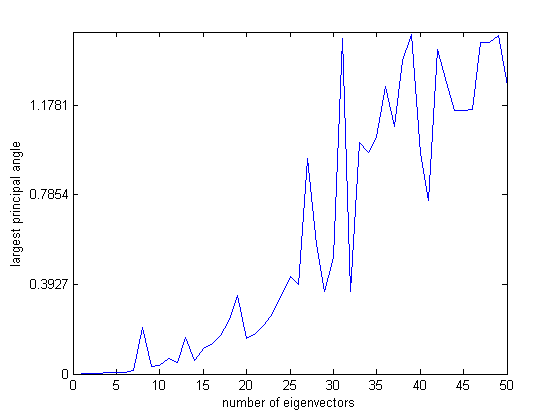 In general we see the top 6 or so extracted eigenvectors are spot on, and then it gets worse, better, and worse again. Note it is not monotonic, because if two eigenvectors are reordered, once we have both of them the subspaces will have a small largest principle angle. Roughly speaking anywhere there is a large spectral gap we can expect to get the subspace up to the gap correct, i.e., if there is a flat plateau of eigenvalues followed by a drop than at the end of the plateau the largest principle angle should decrease. Redsvd provides an open-source implementation of a two-pass randomized SVD and PCA. Nice post. It's worth noting that the randomized SVD is an early-stopped version of classical SVD algorithms like the subspace iteration algorithm. Can you clarify which of the multiple algorithms in Halko et al this is (maybe a variant of 4.4?). Also, do 'pcas' and 'pcav' here refer to the singular values and singular vectors respectively (S and V in svd), and if so is there a reason not to do svd() directly on secondpass instead of eig() on secondpass' * secondpass, supposedly svd is numerically more stable. Thanks.